All sailors must understand the rules of the road in order to prevent a collision at sea. These are a few of the most important ones to understand. The first rule to remember is that a board that is sailing on port (i.e. the wind is coming over the port or lefthand side of the boat) must give way to a boat sailing on starboard (i.e. the wind is coming over the starboard or righthand side of the boat). 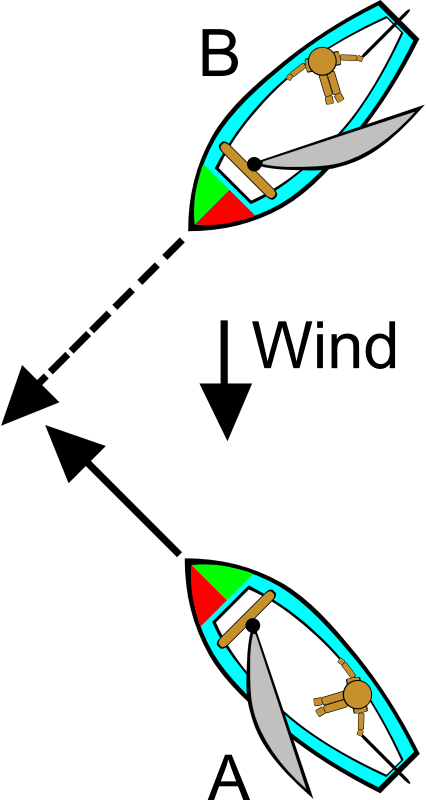 In the diagram below B is on starboard and should maintain their course (keep going in the same direction and at the same speed), allowing boat A who is on port to manoeuvre around them. If both boats are on the same tack then we need another rule to help us. This time both boats are on the starboard tack. In this case the boat to windward must give way (boat B – upwind of the other boat) and the boat to leeward (A) must stand on (maintain its course and speed). If it looks like boats boats will meet head on (including motor boats) then both boats should turn to starboard (right) to avoid a collision. 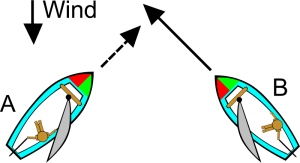 It must be noted though that BOTH the give-way and the stand-on vessels are responsible for preventing a collision and not just the give-way vessel. If the give-way vessel does not take avoiding action then it is the responsibility of the stand-on vessel to take action.